Sunset from our boat deck "in the yard"
While it is possible to scrape barnacles off your boat hull (the outside part of the boat, generally below the water) while it’s still in the water, to paint, it’s gotta be on dry land. 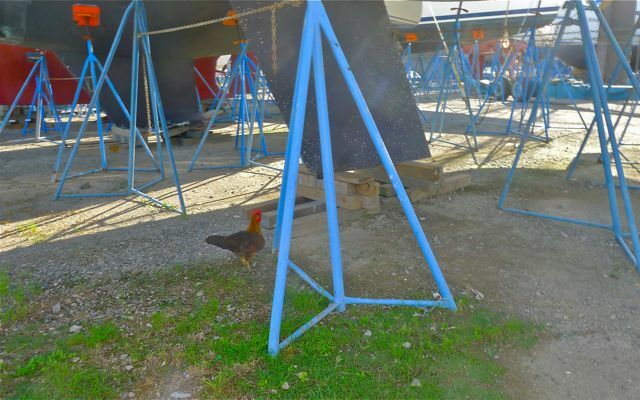 Painting “anti-barnacle and other critter” paint is important to keep your boat ship-shape. 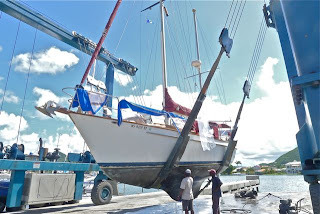 Our boat, Journey, sat in a lagoon full of happy boat attaching critters for 15 months, so we were definitely way overdue for hull scraping and painting. Our boat Journey goes into the Travel Lift "sling,"
The “easy” way to do this is to get your boat winched up out of the water and “onto the hard” with a Travel Lift (a big-assed boat elevator or crane of sorts). 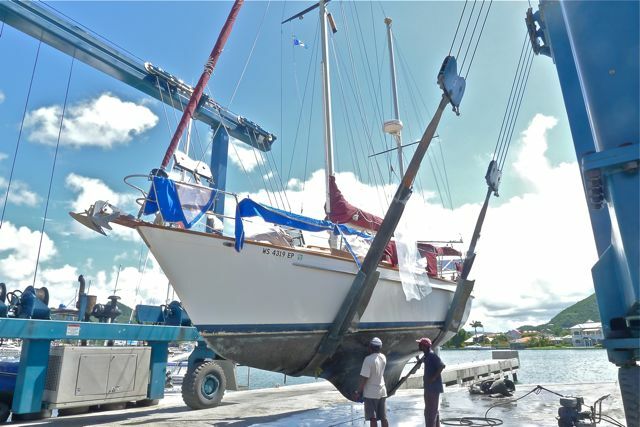 Since boats queue up to use the Travel Lifts in boat yards, and Rodney Bay Marina is no exception, the boats are then set onto well-placed stilts (one hopes!) in the boat yard propped up until ready to “splash” back into the water, so the Travel Lift can move onto moving the next boat In between comes the real nail-biting… when your boat is casually whisked inches past 40 or 50 other boats in the yard also undergoing maintenance work or simply in the yard for “dry dock” storage in a barnacle-free environment. 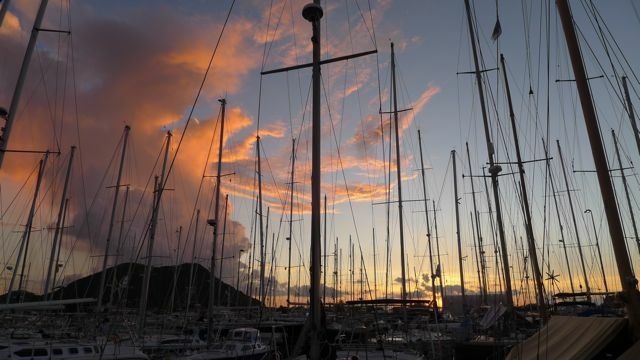 at home in the St. Lucia Rodney Bay boat yard. 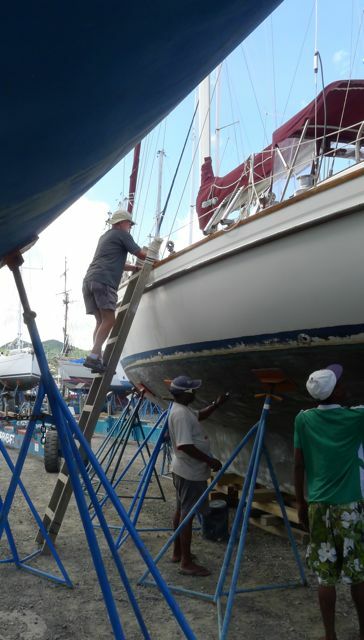 Once dry docked, to get into your boat requires a ladder. 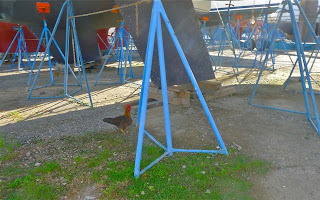 We finagled that, plus power, as unlike most normal folks, we are camping out in our boat while it’s in the boat yard – we believe we are the only overnight boatyard inhabitants, not counting the chickens. However, when nature calls, we have to amble down our ladder and toodle-ooo off the bathroom, weaving our way through a forest of spookily suspended boats. Otherwise, that, along with any other waste drained, will simply drain out to the boatyard ground below our boat. To be avoided. Thanks creative use of bread and paper towels, I was able to cook dinner (perfectly buttery local avocado, the size of child’s football, mixed with tomato, salt, pepper and freshly-squeezed lime juice for our salad, and leftover chicken curry) and clean with minimal waste. As we got a late lift, we didn’t get too much done our first day. It didn’t help that I forgot that one of the three spots marked “water” on our deck is no longer leads to a water tank, but a “dry” storage area. That took some … undoing. To my husband’s credit, he was exceedingly gracious about my screw-up. But we did get two of our three sails up while we were waiting, and a lot of barnacles scraped away. More of that tomorrow, then prepping to paint, and painting. It’s a hot, dirty job, and we’ll spend the next couple of days on it. We may yet splurge for a hotel, though, just, well, because.